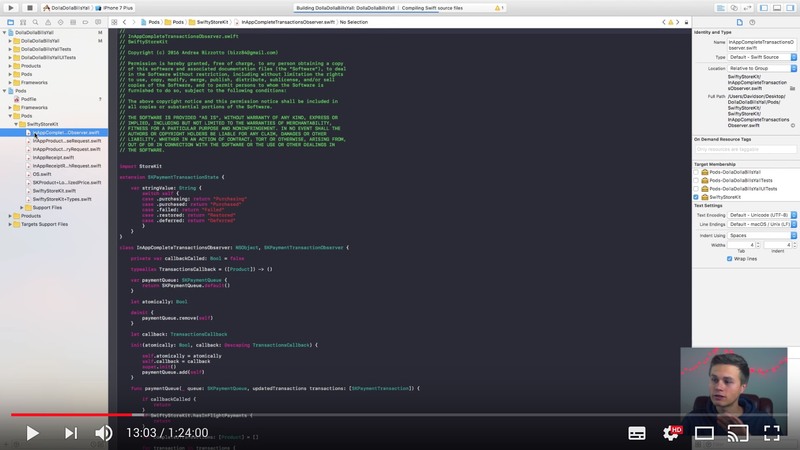 I started Coding with Flutter, a YouTube video series on building apps with Flutter. Interested? Subscribe here. Like SwiftyStoreKit? Please consider becoming a Patron. SwiftyStoreKit can be installed as a CocoaPod and builds as a Swift framework. To install, include this in your Podfile. Once installed, just import SwiftyStoreKit in your classes and you're good to go. NOTE: Please ensure that you have the latest Carthage installed. Got issues / pull requests / want to contribute? Read here. Adding your app's observer at launch ensures that it will persist during all launches of your app, thus allowing your app to receive all the payment queue notifications. If there are any pending transactions at this point, these will be reported by the completion block so that the app state and UI can be updated. If there are no pending transactions, the completion block will not be called. Note that completeTransactions() should only be called once in your code, in application(:didFinishLaunchingWithOptions:). Atomic: to be used when the content is delivered immediately. Non-Atomic: to be used when the content is delivered by the server. Using this purchaseProduct method guarantees that only one network call is made to StoreKit to perform the purchase, as opposed to one call to get the product and another to perform the purchase. This delegate method is called when the user has started an in-app purchase in the App Store, and is continuing the transaction in your app. Specifically, if your app is already installed, the method is called automatically. If your app is not yet installed when the user starts the in-app purchase in the App Store, the user gets a notification when the app installation is complete. This method is called when the user taps the notification. Otherwise, if the user opens the app manually, this method is called only if the app is opened soon after the purchase was started. More information on the WWDC17 session What's New in StoreKit (slide number 165 shows the link above). In most cases, all your app needs to do is refresh its receipt and deliver the products in its receipt. The refreshed receipt contains a record of the user’s purchases in this app, on this device or any other device. Restoring completed transactions creates a new transaction for every completed transaction the user made, essentially replaying history for your transaction queue observer. See the Receipt Verification section below for how to restore previous purchases using the receipt. This section shows how to restore completed transactions with the restorePurchases method instead. 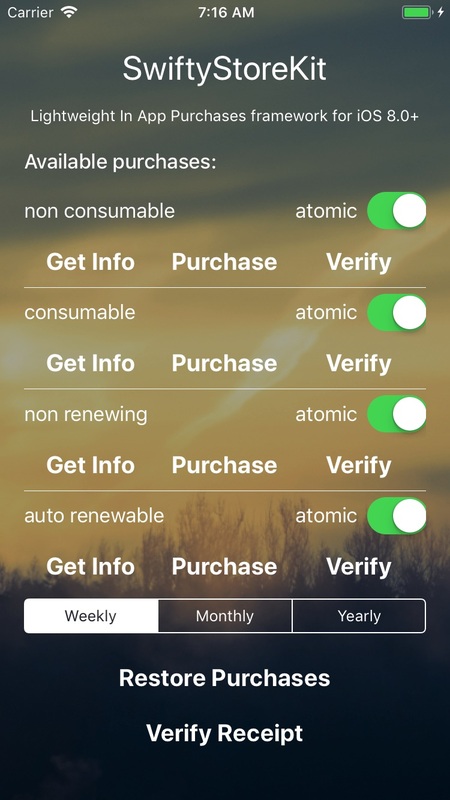 When successful, the method returns all non-consumable purchases, as well as all auto-renewable subscription purchases, regardless of whether they are expired or not. What does atomic / non-atomic mean? A payment is added to the payment queue for your IAP. When the payment has been processed with Apple, the payment queue is updated so that the appropriate transaction can be handled. If the transaction state is purchased or restored, the app can unlock the functionality purchased by the user. The app should call finishTransaction(_:) to complete the purchase. Your application should call finishTransaction(_:) only after it has successfully processed the transaction and unlocked the functionality purchased by the user. A purchase is atomic when the app unlocks the functionality purchased by the user immediately and call finishTransaction(_:) at the same time. This is desirable if you're unlocking functionality that is already inside the app. In cases when you need to make a request to your own server in order to unlock the functionality, you can use a non-atomic purchase instead. Note: SwiftyStoreKit doesn't yet support downloading content hosted by Apple for non-consumable products. See this feature request. When you create a product in iTunes Connect, you can associate one or more pieces of downloadable content with it. At runtime, when a product is purchased by a user, your app uses SKDownload objects to download the content from the App Store. Your app never directly creates a SKDownload object. Instead, after a payment is processed, your app reads the transaction object’s downloads property to retrieve an array of SKDownload objects associated with the transaction. To download the content, you queue a download object on the payment queue and wait for the content to be downloaded. After a download completes, read the download object’s contentURL property to get a URL to the downloaded content. Your app must process the downloaded file before completing the transaction. For example, it might copy the file into a directory whose contents are persistent. When all downloads are complete, you finish the transaction. After the transaction is finished, the download objects cannot be queued to the payment queue and any URLs to the downloaded content are invalid. To control the state of the downloads, SwiftyStoreKit offers start(), pause(), resume(), cancel() methods. The app receipt contains a record of the user’s purchases, cryptographically signed by Apple. For more information, see Receipt Validation Programming Guide. Information about consumable products is added to the receipt when they’re paid for and remains in the receipt until you finish the transaction. After you finish the transaction, this information is removed the next time the receipt is updated—for example, the next time the user makes a purchase. Information about all other kinds of purchases is added to the receipt when they’re paid for and remains in the receipt indefinitely. When an app is first installed, the app receipt is missing. As soon as a user completes a purchase or restores purchases, StoreKit creates and stores the receipt locally as a file, located by Bundle.main.appStoreReceiptURL. However, the receipt file may be missing or outdated. If forceRefresh = false, it returns the local receipt from file, or refreshes it if missing. If forceRefresh = true, it always refreshes the receipt regardless. If the local receipt is missing or forceRefresh = true when calling fetchReceipt, a network call is made to refresh it. If the user is not logged to the App Store, StoreKit will present a popup asking to Sign In to the iTunes Store. If the user enters valid credentials, the receipt will be refreshed. If the user cancels, receipt refresh will fail with a Cannot connect to iTunes Store error. Validate with Apple via the AppleReceiptValidator (see verifyReceipt below). Perform local receipt validation (see #101). Post the receipt data and validate on server. Use this method to (optionally) refresh the receipt and perform validation in one step. This method is based on fetchReceipt, and the same refresh logic discussed above applies. AppleReceiptValidator is a reference implementation that validates the receipt with Apple and results in a network call. This is prone to man-in-the-middle attacks. You should implement your secure logic by validating your receipt locally, or sending the encrypted receipt data and validating it in your server. Local receipt validation is not implemented (see issue #101 for details). You can implement your own receipt validator by conforming to the ReceiptValidator protocol and passing it to verifyReceipt. Once you have retrieved the receipt using the verifyReceipt method, you can verify your purchases and subscriptions by product identifier. Verifying multiple purchases and subscriptions in one call is not yet supported (see issue #194 for more details). Note that for consumable products, the receipt will only include the information for a couple of minutes after the purchase. This can be used to check if a subscription was previously purchased, and whether it is still active or if it's expired. keep a record of the date that each piece of content is published. Read the Original Purchase Date and Subscription Expiration Date field from each receipt entry to determine the start and end dates of the subscription. When one or more subscriptions are found for a given product id, they are returned as a ReceiptItem array ordered by expiryDate, with the first one being the newest. The expiration dates are calculated against the receipt date. This is the date of the last successful call to verifyReceipt. When purchasing subscriptions in sandbox mode, the expiry dates are set just minutes after the purchase date for testing purposes. A subscription group is a set of in-app purchases that you can create to provide users with a range of content offerings, service levels, or durations to best meet their needs. Users can only buy one subscription within a subscription group at a time. If users would want to buy more that one type of subscription — for example, to subscribe to more than one channel in a streaming app — you can put these in-app purchases in different subscription groups. The framework provides a simple block based API with robust error handling on top of the existing StoreKit framework. It does NOT persist in app purchases data locally. It is up to clients to do this with a storage solution of choice (i.e. NSUserDefaults, CoreData, Keychain). The project includes demo apps for iOS and macOS showing how to use SwiftyStoreKit. Note that the pre-registered in app purchases in the demo apps are for illustration purposes only and may not work as iTunes Connect may invalidate them. Apple TN 2413 - Why are my product identifiers being returned in the invalidProductIdentifiers array? Perform a SKProductRequest to obtain the SKProduct corresponding to the product identifier. Submit the payment and listen for updated transactions on the SKPaymentQueue. The framework takes care of caching SKProducts so that future requests for the same SKProduct don't need to perform a new SKProductRequest. The following list outlines how requests are processed by SwiftyStoreKit. SKPaymentQueue is used to queue payments or restore purchases requests. Payments are processed serially and in-order and require user interaction. Restore purchases requests don't require user interaction and can jump ahead of the queue. SKPaymentQueue rejects multiple restore purchases calls. Failed transactions only ever belong to queued payment requests. restoreCompletedTransactionsFailedWithError is always called when a restore purchases request fails. paymentQueueRestoreCompletedTransactionsFinished is always called following 0 or more update transactions when a restore purchases request succeeds. A complete transactions handler is require to catch any transactions that are updated when the app is not running. Registering a complete transactions handler when the app launches ensures that any pending transactions can be cleared. If a complete transactions handler is missing, pending transactions can be mis-attributed to any new incoming payments or restore purchases. Any transactions where state is .purchasing are ignored. See this pull request for full details about how the payment flows have been implemented. Many thanks to phimage for adding macOS support and receipt verification. A full list of apps is published on AppSight.